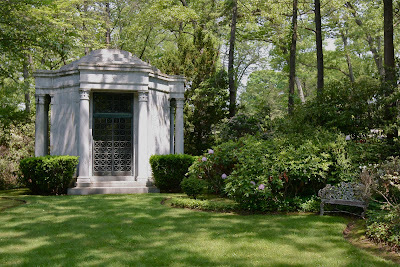 The William R. Coe family mausoleum (of 'Planting Fields') at St. John's Church Memorial Cemetery in Laurel Hollow. Click HERE for more on the Memorial Cemetery and HERE to see other notable residents interred there. 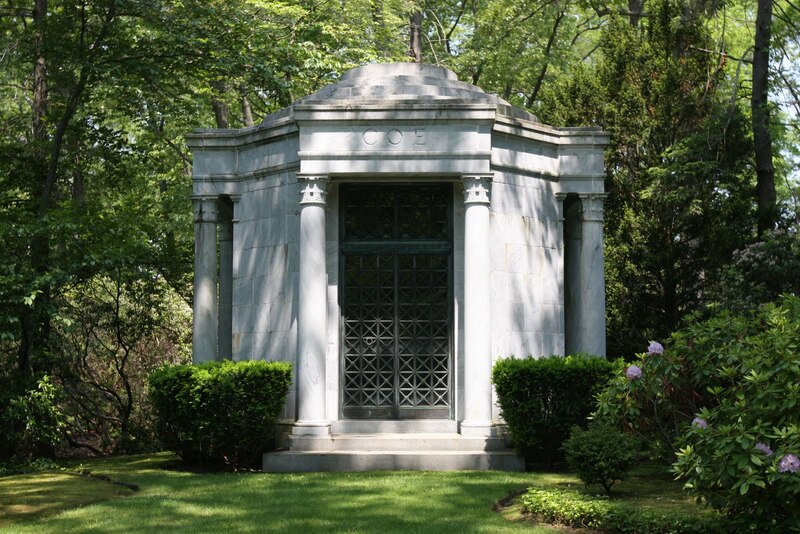 * Guy Lowell, who designed 'Planting Fields" was also the architect of this very good looking mausoleum? 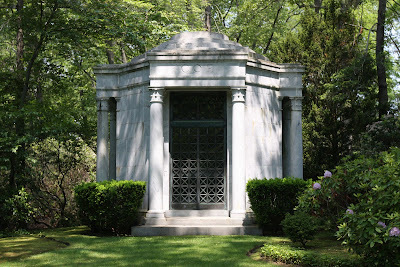 * The thought process for selecting a mausoleum was that much different than it was for selecting a headstone? * How often decendants come & sit on that bench & ponder their ancestors? DFP... Walker & Gillette designed the main house on the foundations of the former G. Atterbury designed residence. Lowell was more involved with the landscaping and greenhouses. This is a very lovely mausoleum regardless, especially as you come upon it it kind of slowly emerges from behind a lot of greenery and has its own little corner off in the eastern section of the cemetery. My guess is that many of the very grand houses built in the United States were designed on the dreams of their creators that they would remain family seats through the generations. Similarly, judging by the size of many mausoleums and the number of family remains they could hold,their creators felt that these structures would house the mortal remains of many of their descendants. Alas, few of the houses survived in family ownership past the patriarch, and as families scattered across the country, even fewer chose to be interred far from where they spent their lives, no matter how beautiful the eternal accomodations offered. My guess, and it's just a guess, is that it has been many years indeed since a warm Coe bottom sat on that cold marble bench. Sorry...I'm always going off topic, but I can't seem to find "Eagle's Nest" on this site, which I find odd...but anyhoo....I was there today, and noticed a magnificant Tudor across the road, when I asked one of the employee's about the home, he simply stated that it was at one time a private residence, but now owned by Suffolk County as administrative offices for the Vanderbilt Museum. Any clue as to what estate this could have been? I have pondered over this business of "accomodation." Looking at the tombs at Greenwood, the implicit rule seems to have been three generations, plus or minus. (Which means that the parents of the builders might have been brought in, or even the much younger, not-much-liked third wives of an oldie.) But at some point, the tomb was firmly sealed, and that was that. This is very different from a typical family plot at St John's, where there is usually room for three dozen people -- or more, if you go to ashes. Once upon a time, people were content to be parked in a family tomb, with just a surname in evidence. Within the tomb there were markers, but they were not accessible to the public. More generally, it's my impression that from 1840 to 1900 (or so), many bones were gathered up from old Manhattan cemeteries and reburied elsewhere. Many of these removals went unrecorded, and to know about them one would need to inquire directly at a specific burial ground. I have noticed that three generation rule too. My antecedants have plots at both Greenwood and Woodlawn and after the third generation, descendants seem to have moved elsewhere, even when there was plenty of room left. We also have a family burial section (far from Long Island) & for most of my life I've known almost exactly where I will reside one day -- some years ago I had a tree planted nearby because I want to be in the shade. But Magnus is correct -- you could plant a nice garden on the plots that were once deemed necessary but now will never be used because ... why be buried somewhere you've never lived? .. why be buried somewhere you've never lived? To shout out, one last time, "Don't you know who we were?" And then there's outright ancestor worship. Offhand, I can't think of a comparable example. I love the idea of your family cemetery- just someone else's family. For you Long Islanders, there's an eerie abandoned cemetery just south of the golf course at the Creek Club. It was the favored location of many "I dare you's" in my youth. Most of my family is in Holy Rood, sounds strange, but the older part is quite nice....but my immediate family prefers cremation....just scatter me to the winds.